The Revar Cine Rota-Tray 4×5.65/138mm Variable ND Kit is a two filter system designed to fit into a two stage 4×5.65 Mattebox to create a Variable ND Filter with 1.6 to 8 stops of light loss range. The Revar Cine Rota-Tray 4×5.65/138mm Variable ND Kit is a two filter system designed to fit into a two stage 4×5.65 Mattebox to create a Variable ND Filter with 1.6 to 8 stops of light loss range. Simply place the Revar Cine 4×5.65 /138mm Rota-Tray with Circular Polarizer in the rear stage of the Mattebox and place the Revar Cine 4×5.65 Linear Pol MC in the front stage and rotate the gears on the Rota-Tray for a variable neutral density effect. The Revar Cine Rota-Tray 4×5.65/138mm with Circular Polarizer is a geared filter tray designed and manufactured in the USA from aircraft grade aluminum and poly materials to interface with the latest 4×5.65 matte boxes on the market today. Commonly referred to as a RotaPola, RotoPola, or Rota-Pola, this geared tray allows for a use of a common 138mmm unmounted circular Polarizer in a rectangular 4×5.65 tray. Simply insert it into a top loading 4×5.65 size matte box tray slot and spin the gear on either side of the filter tray to rotate the filter inside. This allows for easy rotation of the filter without the need for cumbersome locking and unlocking of a rotating filter stage. The Rota-Tray also allows for rotation of a filter in matte boxes that do not feature a rotating filter stage or if a secondary rotating filter is needed in a non-rotating stage. The Rota-Tray also has features missing from other competitive products such as standard 0.8 pitch gears on both sides of the filter tray for use from either the operator or dumb side of the camera, a 1/4-20 female threaded hole for mounting of a wireless follow focus for remote crane or jib operation of the filter, and an overall low weight and profile design for maximum convenience. 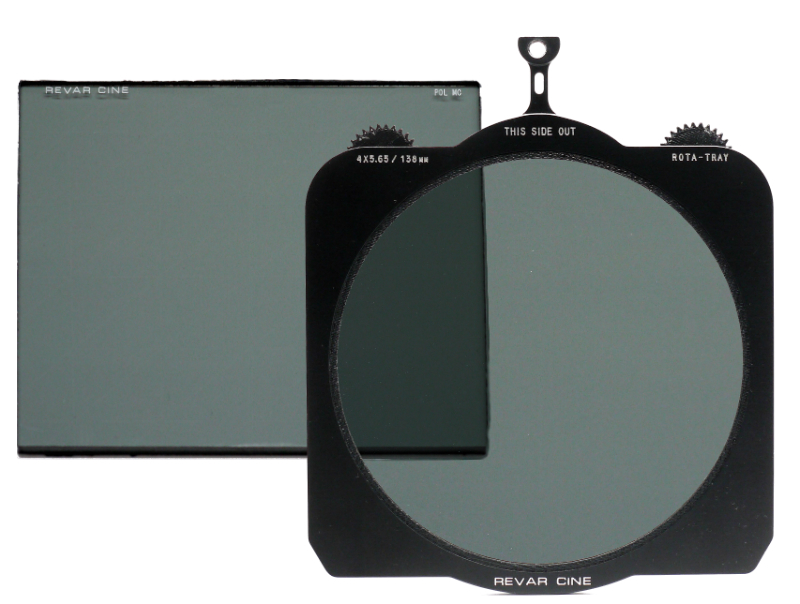 The Revar Cine Circular Polarizer found in the Rota-Tray is a mid-efficiency Circular Polarizer constructed of Schott B270 glass featuring 38% transmission (1.5 average stop loss) and a special military spec hard Broadband Anti-Reflective Multi Coating (MC) that minimizes reflections and resists scratches from everyday use for optimal image quality. The Revar Cine 4×5.65 Linear Pol MC is a mid-efficiency Linear Polarizer constructed of Schott B270 glass featuring 38% transmission (1.3 to 2 stops of light loss) and a special military spec hard Broadband Anti-Reflective Multi Coating (MC) that minimizes reflections and resists scratches from everyday use for optimal image quality. The multi coating found on this filter is not common in motion picture filters which are generally polished but not coated. Multi coating greatly increases light transmission for maximum image quality.